The creator of "Calvin and Hobbes" is notoriously reclusive. Does he owe it to his fans to stay in the spotlight? In the days of 4G wireless networks and Twitter, when virtually every moment of a person’s life can be tracked online and many people offer up that information freely, it’s a rare thing to come across a public figure who not only doesn’t buy into the idea of constant communication but takes themselves in the opposite direction — completely out of the spotlight. The term “recluse” seems like a dirty word, a slur — “private” or “introverted” seem much fairer ways to describe someone than a word that suggests agoraphobia — but that’s how many would describe artists ranging from Emily Dickinson to Marcel Proust, Harper Lee to J.D. Salinger. Some say that the “recluse” is an endangered species, but to my knowledge, there’s still one artist who is keeping the idea of the private public figure alive: Bill Watterson, writer and illustrator of the beloved comic strip "Calvin and Hobbes." Depicting the adventures of a precocious six year old and his tiger best friend and syndicated by the Universal Press Syndicate in 1985, "Calvin and Hobbes" had a solid decade of unprecedented success, running a total of 3,160 strips long, collected into 18 books, and appearing in nearly 2,500 newspapers across the country. 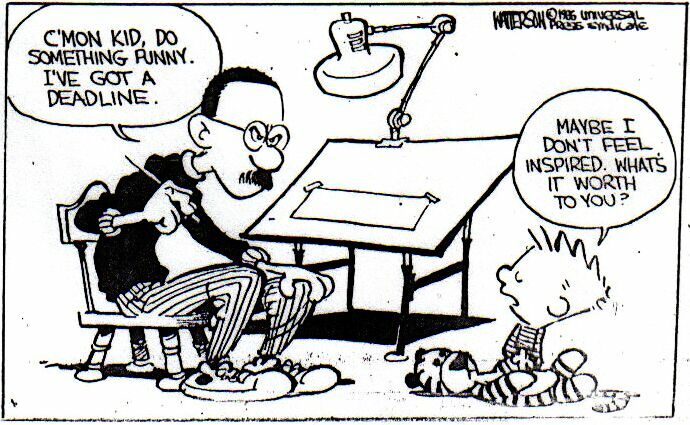 For Watterson, who from the very beginning was averse to the attention "Calvin and Hobbes" brought him, the personal triumph of writing a successful comic strip was at times overshadowed by the burdens that came with it. Whereas others have relished such a spotlight, Watterson shrank from the publicity, sure that neither he nor his work would survive what he saw as the curse of celebrity. After years of fighting, Watterson finally gained full rights to "Calvin and Hobbes" in early 1991, thus ensuring that toy company’s dreams of Spaceman Spiff underpants and stuffed Hobbes dolls on their shelves would never be a reality. But Watterson’s ethical battle still wasn’t over — in fact, it would last well beyond the final "Calvin and Hobbes" panel he drew in December of 1995. This time, it would come in the form of reporters, and the ethics in question were theirs. Hundreds of fans have undoubtedly made pilgrimages to Chagrin Falls, Watterson’s small hometown to the east of Cleveland, seeking him out even as he made it clear that he wanted to be left alone. And since he more or less disappeared in mid-1990 (his last known public appearance was at his alma mater of Kenyon College in Ohio, where he gave a commencement address titled, “Some Thoughts on the Real World From One Who Glimpsed It and Fled”), dozens of journalists have made the same trip. The Plain Dealer sent a reporter in 1998 and again in 2003; the Washington Post sent someone in 2003, as did the Cleveland Scene. All the reporters hoped to score that elusive golden interview with the man behind "Calvin and Hobbes," and all found that Watterson proved harder to find than anticipated. The reporters went back to their newspapers more or less empty-handed, little more to show for their trip than a possible sighting from a distance or a brief conversation with Watterson’s mother. When a private figure becomes so beloved, the line between diligent professional and obsessive fan can quickly become blurred. Author Nevin Martell, for example, talked to Watterson’s friends, colleagues and family for his 2009 book "Looking for Calvin and Hobbes." Years of work resulted in a fairly complete memoir of Martell’s fandom but yielded no interview with Watterson himself, who rebuffed the request for one through his intermediary in many such cases, former UPS editor Lee Salem. For Joel Schroeder, the director of the documentary "Dear Mr. Watterson” (which will be screened at the Cleveland International Film Festival in April), the decision not to contact Watterson was fairly clear from the days of pre-production. After reading Martell’s book in 2009, the choice became even more obvious — respect Watterson’s privacy. Don’t even try to reach out. In 2010, former Plain Dealer features writer John Campanelli sent email questions to Watterson, not very hopeful that he’d get a response, and struck gold when Watterson wrote back to him with six succinct, yet personable and funny answers, breaking the near-complete radio silence he had skillfully maintained over the preceding two decades.